Sold by Zenify AU and Fulfilled by Amazon. Gift-wrap available. 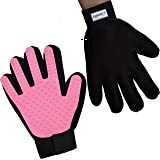 🐱 REMOVE LOOSE FUR, DIRT AND DUST GENTLY -- These one-size-fits-all grooming brush gloves are essential for taking care of the fur of dogs, puppies, cats, kittens and most furry pets. Fur can quickly become tangled if not brushed regularly and can lead to a build-up of dirt and dust. With the Zenify pet grooming glove, you can brush out excess fur, dirt and kinks with ease. For allergy sufferers, preventing the build-up of dog or cat hair around the house is a welcomed bonus. 🐰 CIRCULATION STIMULATION AND PAMPERING MASSAGE -- Not only does the glove stimulate circulation, it also provides your beloved pet with a grooming massage. Pets prefer the pampering texture of soft silicon rather than the old style rigid equipment and accessories. As a soft glove with 180 silicon tips, it naturally adapts to the contours of your pet's body. 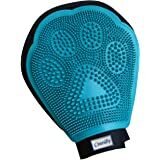 Zenify’s pet grooming glove is therefore a great suggestion for nervous animals like puppies. 🐹 EASY TO CLEAN BREATHABLE MATERIAL -- The high-quality silicon layer on the inside of the glove means that it is super easy to clean. Fur mattes nicely together on the glove, but separates from the silicon effortlessly. The glove's outer material is breathable and quick to dry, meaning your glove won’t stay wet or get mouldy from moisture retention. 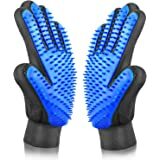 🐶 WET OR DRY USE FOR GROOMED FUR -- This 2-in-1 glove can be used either wet or dry. For wet use apply a suitable shampoo to your pet's fur and gently massage it in with the glove. 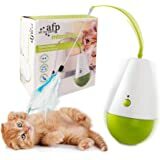 This is particularly practical when bathing your pet. For dry use, comb or stroke with a gentle, light pressure along the fur in the direction of hair growth until you feel that all of the excess hair has been removed and the fur is well combed. 🐎 WASHABLE AND EASY TO CLEAN -- Pet products can pick up odour after prolonged use. 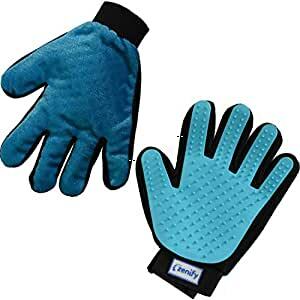 For Zenify’s pet grooming mits, this isn’t a problem as the breathable material and soft silicon are washing machine friendly. Throw it in the washing machine to freshen it up. 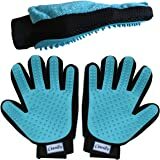 Zenify’s five-finger grooming gloves are the must have for 2018 your pet will love! 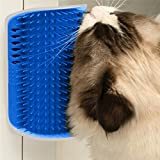 The 180 soft and flexible silicon tips allow you to groom, bathe and brush your pet’s fur to remove dirt, grime and loose hair. The breathable fabric let’s you use this wet, dry and follow any contour of your pet’s body. Reverse velour side is specially designed to collect loose hair from furniture and clothes.